Garrafon park is a recreation center, located in Isla Mujeres. Famous for its beautiful reef and a spectacular panoramic view of the Caribbean Sea, Cancun and the bay; from the highest cliff of the Yucatan Peninsula. The park´s main attractions are: Snorkeling at the coral reef, considered one of the most beautiful reefs of the world with a maximum depth of 12 feet and about 1000 feet long; kayaks, hammocks, salt water pool, the lighthouse, walk to the Mayan Ruins and Sculpture Park. Take a Bicycle Tour and visit some of the most interesting sights! Relax and take in a tropical drink in the beach-side lounge chairs! 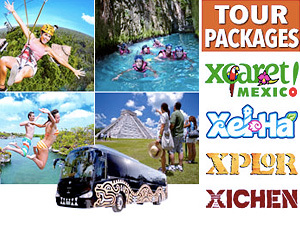 Schedule: Daily except saturday at 9:00 AM from Marina Aquatours at Km 6.5 of the Cancun Hotel Zone. It is very easy to get either by public bus or taxi. Duration: Approximately 8 hours. Ferry returns at 5:30 PM at Playa Langosta at Km 5 of the Cancun Hotel Zone. Round trip ferry transportation between Cancun and Isla Mujeres from the ferry pier "Marina Aquatours". National open bar on board and at the park (only available for adults 18 years or older). Buffet lunch at Garrafon Natural Reef Park. Only Vip Service: VIP section with hammocks, infinity pool, Jacuzzi and lounge chairs, premium international open bar and the best international cuisine (shrimp, salmon, sushi, ceviche, grilled meat, fresh fruit and vegetables). Free admission for Infants (1-5 years and shorter than .90cm tall). For safety reasons, pregnant women with more than 5 months are not allowed in any of our aquatic activities. Pregnant women with 5 months or less will be able to participate only if accompanied by another adult and having signed the responsibility form. Use only biodegradable sun lotion to protect the animals and their environment. No refunds will apply for cancellations made within 4 days before your program. All changes are subject to availability, on 24 hours prior request. Partial or full cancellations will be subject to a 10% charge, per person.